With the growing demand for bandwidth from fast-growing cloud services and data centers, 100G networks are growing rapidly. Ovum reported that by 2021, 100 gigabit (100G) Ethernet transceivers would exceed 15 million (Figure 1).As an important part of the 100G network, 100G optical transceivers are becoming more and more popular. At the same time, the cost of the associated component fiber (PSM4) and a large number of components (including PSM4 and CWDM4) are reduced, and the 100G optical transceiver is becoming more and more popular. What are the types of 100G optical transceiver modules? What agreements do they follow? How should the correct 100G optical transceiver module be selected? This blog will introduce 100G optical transceiver related knowledge, hope to help you. Since the advent of the 100G network, IEEE, multi-source Protocol (MSA) and so on proposed a variety of standards for the 100G optical transceiver. In these standards, the PSM4 and CWDM4 standards developed by MSA industry organizations are more suitable for 100G QSFP28 optical transceivers in the market. The following table shows the details of the 100G optical transceiver standard. The 100G PSM4 uses 8 parallel fibers (4 send and 4 receivers), each sending 25Gbps (Figure 2). 100G PSM4 is a single mode parallel 4-channel optical transceiver, which is mainly applied to 500m scene in the data center. It provides low-cost solutions for long distance data center optical interconnects and services for parallel single mode infrastructures. and CWDM4 (Fig. 3), contrary to PSM4, uses the retrocession multiplexer to reduce the number of optical fibers to 2, and the CWDM4 MSA goal is to run a generic specification of up to 2 kilometers of low-cost 100G optical interfaces in data center applications. According to different form factors, 100G transceivers can be usually divided into CFP, CFP2, CFP4, CXP, and QSFP28 Among them, CFP, CFP2, CFP4, and CXP are the early form of 100G optical transceiver, but QSFP28 is the newest version of 100G Optical transceiver, because of its lower power consumption and higher density, it has become the mainstream form of 100G optical transceiver. Like 40G QSFP + with 4 x 10Gbps channels, 100G QSFP28 is implemented with 4 x 25Gbps channels. CFP Multi-source agreement (MSA) defines the requirements for hot-swappable transceivers to be applied to 40G and 100G network transmissions, including next-generation high-speed Ethernet (40GbE and 100GbE). 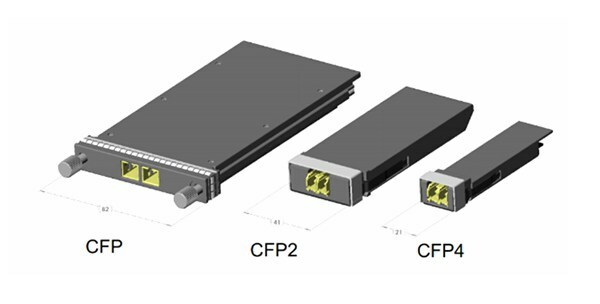 The CFP optical transceiver supports the transmission of multiple rates, protocols and link lengths on Single-mode and multimode fibers, including all physical media-related (PMD) interfaces included in the IEEE 802.3BA Standard. There are three types of 100G networks: 100GBASE-SR10 100m, 100GBASE-LR4 10km, 100GBASE-ER4 40km. 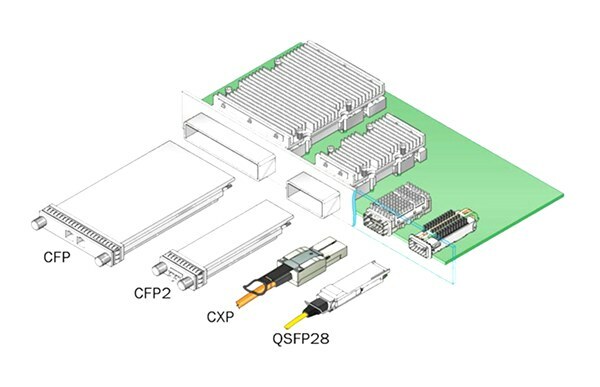 The CFP optical transceiver is designed on the basis of a small pluggable optical module (SFP) interface, which is larger in size and supports 100Gbps data transmission. The electrical interface used by the CFP optical transceiver transmits in each direction (RX, TX) using the 10 x 10Gbps Channel. The CFP optical transceiver can support a single 100G signal, OTU4, one or more 40G signals, OTU3 or STM-256/OC-768.